If you are about to launch a new WordPress site that can help you make most from the traffic before the site is finally launched, then you must check the best coming soon plugins for WordPress. With these Coming Soon Plugins, you can divert the traffic to your blog and even subscribe users to your email updates before the user’s launch. This way, you already have a great volume of traffic before the final launch of your site. From email subscription box, social buttons to responsive landing pages, you can prepare it all with the powerful Coming Soon Plugins for WordPress. “Under Construction Page lets you create a coming soon, maintenance or under construction page for your site in a matter of minutes. Everything’s done in a few clicks while the plugin controls everything needed for the maintenance mode to run properly. It makes sure that your users get a nicely designed page instead of seeing broken elements of a site you’re fixing or still building. All you have to do is choose the template you like, add content and social icons to lead to your favourite social media accounts. It is one of the finest solutions that allows you to add a coming soon page before the launch of your final site. This plugin comes with numerous exclusive features like Mail chimp integration, maintenance mode, AWeber integration, and search engine optimization. This plugin is available for free as well as paid version, so you may select one that meets your requirements. It is an efficient solution for those who are planning to launch a membership site that can help you make most from every single visit. It is mobile-friendly and responsive solutions that can help you grab more audience before the ultimate launch of your site. Another amazing WordPress plugin that is available in both free and paid versions is Coming Soon by Webriti. This is the best plugin for those who wish to integrate the plugin with a premium email marketing tool, such as AWeber, Mail Chimp, Constant Contact, Get Response and more. While the free version offers limited features, you can go for the paid version of this plugin at just $29. Display under, SEO friendly, pleasing design, customize favicon, status code, and go live when the countdown reaches 0 are some of the prominent features of this plugin. This is a spectacular plugin that has been designed keeping in consideration the dynamic needs of designers and marketers. As a result, it delivers an intuitive design by placing together the landing and launch site pages. It is easy to use, and so you can organize the landing pages conveniently, gather data, and even customize the pages as per your need. Besides the exclusive customization functionality, it allows you to integrate more closely with advertising software like Mail Chimp and AWeber. This plugin is introduced by MyThemesShop and is one of the finest options for those planning to launch a coming soon page, under construction page, or maintenance mode page. This is a lightweight plugin, and so it will not impact the website loading speed. Also, it supports all sorts of WordPress themes, and the most amazing feature of this plugin is that it comes with 3 unique and impressive default templates. If you do not like the default template, then you can even create your own. You would find all essential features in Launcher that are essential for any maintenance mode, under construction or coming page soon. With the in-built subscription form, your visitors can subscribe easily to your website so that they can get all essential updates about your site. Besides supporting all major auto-responders, it offers multiple awesome features to users, such as an advanced counter, easy translation, social media icons, and more. If your blog is under maintenance, then you can add a maintenance page to its use of this plugin. This way, your regular visitors will get an update that your blog is under maintenance. 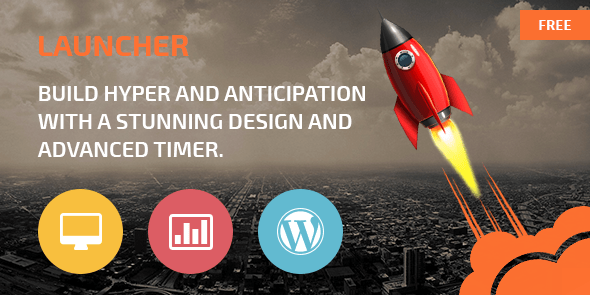 Moreover, it is even possible to add a coming soon page for a new website with this plugin. Any user with admin rights would get complete access to the blog. In this case, only your registered users would be able to see the front end of your blog. Also, you can use a date along with a countdown timer or can even set a defined value for more information. The unique aspect of this plugin is that you can customize the settings as per your requirement. While there are more other Coming Soon Plugins for WordPress, few don’t offer efficient integration with the major email marketing software. Therefore, you can go for any of the above-mentioned Free WordPress plugins that best meets your requirements.